What is embroidery? It's a design created in thread, sounds simple right? Embroidery can be extremely simple or amazingly complex when in the hands of a master. In the modern age, embroidery is done by computer for application onto everything from t-shirts and golf shirts to hats, patches, jackets, sweatshirts or just about anything that can fit into the machine. The process to transform an image or a logo into stitches begins with digitization. 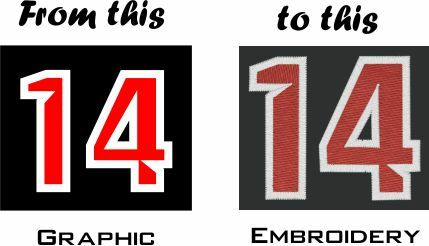 A logo from the client is logo is brought into embroidery software as a background image. Then stitch by stitch that logo is transformed from a flat printed image into a 3D image made from stitches. So now the big question - how much does it cost? Well it can be anywhere from a few dollars to hundreds of dollars. It's like looking at two cars for sale on a lot - both have the same brand and model on them; but their costs vary by thousand of dollars. Embroidery is priced per project based on two main factors - how many stitches in the design and how many pieces are being completed? A project for 36 pieces of golf shirts with a small over the heart design will be very different than having 10 jackets with a 100,000 stitches back design for a construction company. Best thing to do is to contact us either through this website, our email or phone.